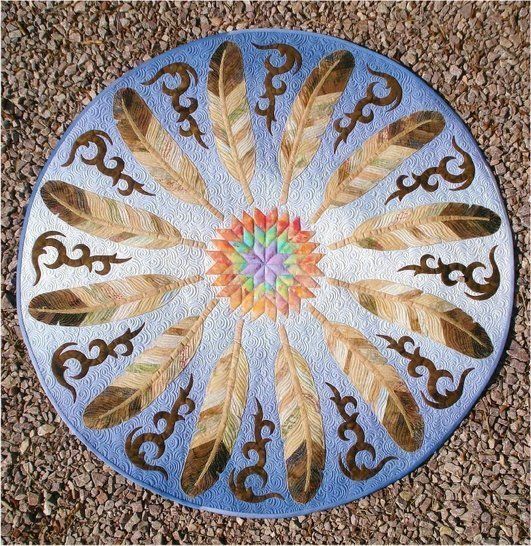 Sun Dance wall hanging. 43 inches in diameter. Raw edge applique and strip piecing. You sew cream and brown strips together, add fusible to the back, then cut out the shapes with a plastic template. Everything is fused to the background. 2 yards sky blue for background. Assortment of cream and tan batiks fat quarters for feathers and spines. Assortment of brown batiks fat quarters for bottom of feathers. Colorful batik scraps for center star.